flags, originally uploaded by shooting brooklyn. 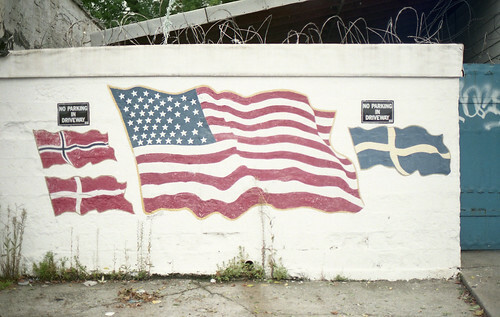 Scandinavian and American pride in rippling color. It looks like this is Denmark, Sweden, Norway, and the USA. The Finnish flag is missing, but there's room under Sweden. That's so interesting, I wonder where exactly this is located. I'd forgotten about the Scandinavian influence in Sunset Park. What block is this on? The photographer describes the location as "on the border of Sunset Park and Dyker Heights." You can see more of his photos and their descriptions by clicking on the photo itself. He has a lot of excellent shots from all over Brooklyn. Not to nitpick, but the Icelandic flag is also missing :) And Finland is geographically part of Scandinavia but Finnish culture and language is distinctly non-Norse. Pick all you want. I just thought it was interesting that Finland wasn't there due to the obvious Finn presence in Sunset Park.